EDITED: UPDATED COMBATANTS NAMES ON WALLPAPER. PLEASE FULL VIEW. THUMBNAIL LOOKS HORRID. IT'S NOT SO BAD, I PROMISE! wall is dedicated to kuroimisa ^^ obviously, i dare not say this wall is worthy of an artist of her stature. 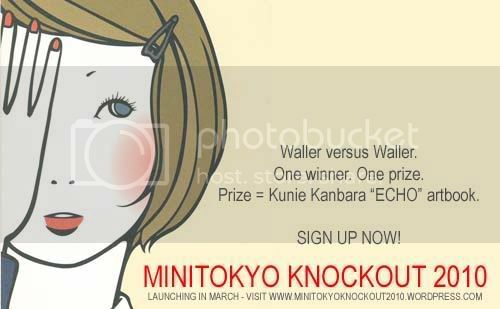 this design was conceived to "promote" lady kuroimisa's "Minitokyo Knockout 2010 Competition" held in March. besides being one of finest wallpaper crafting artisans i have ever seen; she also has shared many great artists, such as Kunie Kanbara. i decided to make a humble attempt with an artwork i found on her site and decided to avoid layering the work with shapes and such and try to make a virtually complete typographic styled wall within the confides of her work. the vector and typography were done solely in Illustrator. intelligible comments and constructive criticism are always appreciated. anyway, interesting design. 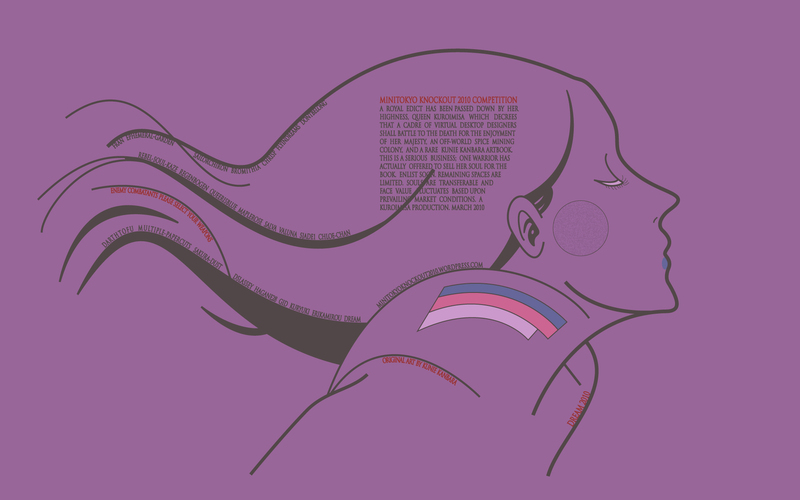 I like how you put all the combatant's names along the curves of the hair. I do however, wish that the lines are more varied in weight, and tapered at the end (using fill path instead of stroke path, or have simulated pressure)... also, the cheek circle looks slightly out of place with that texture and outline. Back to the wall, love it from top to bottom, nice colors, idea and the font is pretty nice and fits on the style of the rest, just have to agree with maple about the weight on some lines, specially on the hair. I agree with Rebel and maple concerning the lines. I dont like the color becuz it looks like pale! But I'm a fan so its definetely a fave! Kunie equal pure love so you got bonus for that. See you at the comp! Yay for more Kunie walls! You did a splendid job with this scan! And I love the shade of purple! always liked your walls, yay for kunie! i'll try my best in the competition :3 good luck everyone!